Hi Tech Support, how are you? I have some questions for you regarding the above antibody. I am working with guinea pig protein brain samples. I used Invitrogen PARIS kit that allows RNA and protein isolation from the same sample simultaneously. In this kit, after adding the lysis buffer and homogenising the brain sample, the homogenised sample can be immediately be kept aside without any further action for protein analysis. 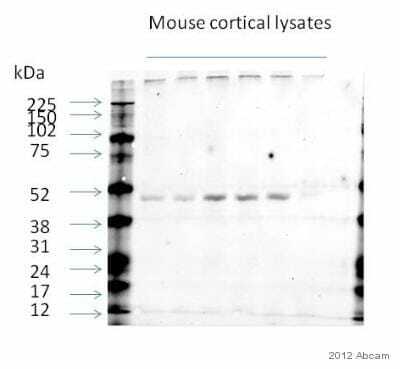 I am using B-actin as reference for my western blot analysis. I am trying to measure a lot of samples (control vs treated vs time-points) and I am then using ImageJ to analyse the densitometry of my bands relative to B-actin to get a relative protein expression value. Use 15ug protein per sample (dilute with water and 6x loading dye added). Load a total of 12uL. Previously, I have combined the antibodies of GABA A and B-actin in the same solution for primary antibody incubation and use anti-mouse and anti-rabbit in the same secondary antibody incubation on the blot (detecting two proteins at the same time on the same blot). From these results, I got two very distinct bands, one at the ˜48kDa area (which I thought is the B-actin band) and a very distinct one at ˜75kDa (which I assumed is the GABA-A band). Of course, looking at the data sheet, this did not make sense as GABA-A is 52-55kDa. So I did not understand why I was seeing a very distinct band at the 75kDa area. I repeated this many many times and for many many samples and kept getting the same results, though each time when I quantified the intensity of the assumed GABA-A bands, it changed each time giving me highly variable results. So then, I separated out the antibodies and did them individually. After Ponceau S staining, I cut the membrane up one 50kDa and below, and the other is the top half (containing the 75kDa mark). I made different primary ab solutions and incubated them separately. B-actin came out perfectly but there was nothing for the top half of the membrane (with GABA-A antibody). I then repeated the whole thing again from the start, using the same protein samples except this time, I did purely GABA-A antibody alone without cutting the membrane up at all. Nothing came up, not even at the 52-55kDa area. Now of course I am stuck. I reordered a new antibody (ab33299) but I am now considering trying from a different company or getting a positive sample in like HeLa or HepG2 cell line to test if the GABA-A antibody works. Please Let me know what I can try next or if I should try a different GABA A antibody or a positive control? You are correct in thinking the band expected for the GABA A Receptor alpha 1 would be around 52 kDa. Unfortunately, we have not tested this antibody with guinea pig samples as yet and cannot therefore say conclusively that it will be able to cross react. I would therefore say that using a positive control would be very worthwhile. 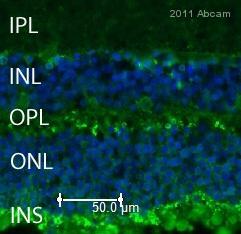 However, I don't think the HeLa or HepG2 would be suitable as this is a protein mainly expressed in the brain. 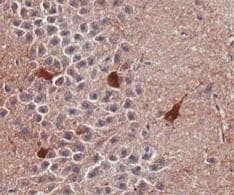 Do you have any access to human, rat or mouse brain lysates? If you do, I would suggest trying these. We do not currently have any anti-GABA A Receptor alpha 1 antibodies which have been shown to detect the guinea pig protein but I can checkwhich antibodies may be the most appropriate to try if you would like.